In this paper, the bending moment capacity of typical container sides designed according to the standard has been investigated. Furthermore, the strength of typical transverse beams in the container floors has also been investigated and a comparison between the strength required to facilitate a uniformly distributed payload and the wheel load produced by a forklift have been made. 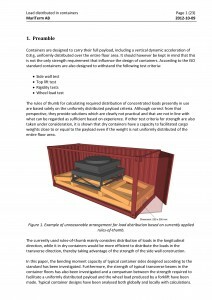 Typical container designs have been analysed both globally and locally with calculations..
As part of the revision of the IMO/ILO/UNECE Guidelines for Packing of Cargo Transport Units, MariTerm has performed a series of tests to determine the strength of containers and to suggest suitable bedding arrangements for concentrated loads. Differences in Cargo Securing Regulations – How could we achieve harmonization? 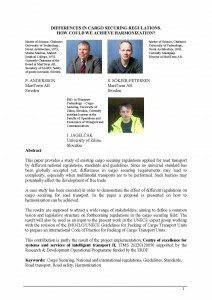 This paper provides a study of existing cargo securing regulations applied for road transport by different national regulations, standards and guidelines. 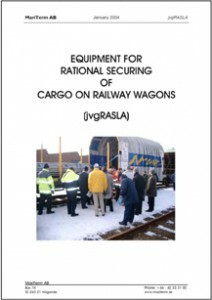 Since no universal standard has been globally accepted yet, differences in cargo securing requirements may lead to complexity, especially when multimodal transports are to be performed. 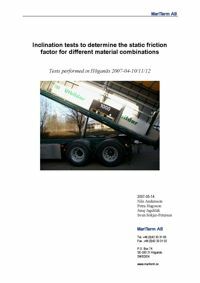 The paper was written for the HVTT Conference in Stockholm 2012 and is available through the link below. MariTerm AB has on behalf of the Swedish Transport Agency – Maritime Department performed a study by pulling used lashing equipment to break in order to find out at which level of wearing and damage lashing equipment has to be scraped. A pilot study was carried out at the site of Ro-Ro International AB in Gothenburg 2009-01-16 and main tests were carried out at the site of Forankra in Vårgårda 2009-04-15 and at the site of Ro-Ro International AB in Gothenburg 2009-04-16. Additional tests with Tor Lines trailer lashings were carried out at RoRo International 2009-04-29 and with provoked edge damages on new equipment at Forankra 2009-08-12 and 13. 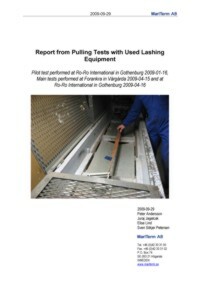 The report from the pulling tests of used lashing equipment is available through the links below. 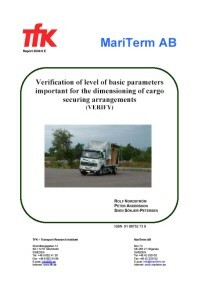 MariTerm AB has on behalf of SIS performed practical tests of static friction using the Swedish cargo securing vehicle to test various friction surfaces and measure the static friction. During the tests, the test procedure prescribed by EN 12195-1 was followed. The report from the inclination tests is available through the link below. Järnvägen har under de senaste decennierna tappat marknadsandelar gentemot övriga transportslag, vilket kan bero på den tuffa transportmiljön som ger upphov till bräckageskador. Orsakerna till bräckaget antas vara påkänningar under transport samt påkänningar vid rangering. I projektet undersöks omfattningen av bräckage, orsakerna till bräckage och hur bräckage kan undvikas. Om problemen med bräckage kan minskas finns en stor marknad med högvärdigt gods som kan överföras från landsväg till järnväg. En PowerPoint presentation av projektet kan hämtas här. Pressrelease med bilder kan hämtas här. Projektet VERIFY genomfördes under hösten 2004 för att verifiera vilka grundläggande principer som bör ligga till grund för gemensamma riktlinjer för lastsäkring inom EU. De skillnader som föreligger mellan principerna i de internationellt vedertagna riktlinjerna från IMO jämfördes med principerna i den europeiska standarden EN 12195-1 och den tyska standarden VDI 2700. Det går även bra att beställa rapporten i tryckt form via MariTerm. Projektet RASLA för fordon avslutades sommaren 2001. Eftersom det ansågs som ett mycket lyckat projekt väcktes tanken om att göra ett motsvarande projekt för järnvägsvagnar. Såväl Vinnova som Banverket samt ett flertal företag ställde upp med finansiering och projektet startades på hösten 2002. Projektet har benämnts “Utrustning för rationell säkring av last på järnvägsvagnar – jvgRASLA”. Då Vägverket genom VVFS 1998:95 ändrade TSVFS 1978:10 om säkring av last på fordon, skapades förutsättningar för en rimlig och rationell lastsäkring. På fordon saknas emellertid i många fall utrustning för att kunna ta tillvara de möjligheter till rationell lastsäkring som föreskrifterna skapat. Industriförbundet tog därför initiativ till att ett projekt startade, med syfte att få fram förslag på utrustning som skulle ge chaufförer och utlastare möjlighet att utföra lastsäkringsarbetet enklare och snabbare. 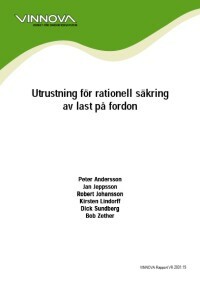 Projektet har benämnts “Utrustning för rationell säkring av last på fordon- RASLA”. Det går även bra att beställa rapporten i tryckt form via TYAs hemsida. The report discusses rules for transport of grain in bulk. Existing international rules, which chiefly also apply for transports in the Baltic area, have primarily been worked out according to proposals from the big grain exporting countries, USA, Canada and Australia. As basic material when setting up the rules, large bulk ships in ocean-going traffic have been used. the relatively few incidents and accidents recorded with grain carrying ships in restricted waters. more liberal rules than the international ones have been proposed for transport of bulk grain in the Baltic area, including the Skagerrak. These rules mean that a free grain surface is assumed to shift maximum 12 degrees in the Baltic, instead of 15/25 degrees according to the international rules. However, the international stability requirements after a grain shift, are proposed to remain unchanged. Criteria for grain securing arrangements have also been dealt with. The acceleration has a probability level corresponding to the maximum value in 20 years of what will effect the cargo. The lashing force is determined by means of a calculation model using statistical input values.The capacity of the lashings has been determined by testing, also taking into account the time factor for the equipment in use. The result is presented with suitable test methods and safety factors for different types of lashing equipment. When the winter storms begin in the North Sea, cargo and trailers on board trailer ships will suffer damage. The reason for this is insufficient securing of trailers to the ship and of the cargo on the trailer. This report analyzes the problems and offers proposals for measures to be taken for the safe securing of trailers. 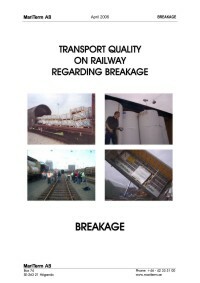 It also proposes how to minimize the cost of handling damage on trailers.The report contains a thorough investigation of international and national rules and regulations, affecting the design and the use of road trailers, and can, in this context, be used as reference literature. An important part of the result is a proposal for standardiza-tion of lashing points in trailers and on ships. A road trailer stowed on a Ro/Ro ship is difficult to describe in mathematical formulas. This report contains a complete description of a computer-based model with approximately 40 parameters, including ship, trailer and lashing parameters. The report also contains a large number of results from use of the model, as well as conclusions and recommendations for the establishment of international rules for lashing. 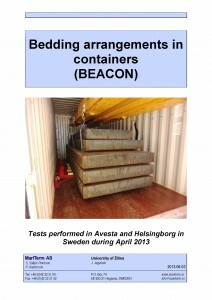 The report has been supplied to IMO by the Swedish authorities. Shifting of cargo on board a ship can cause damage to the cargo and risk the safety of the ship. Due to some severe accidents in 1980 a study was undertaken, the purpose of which was to propose common rules for calculation of forces acting on the cargo, and also to propose how to establish a ship’s manual for securing of the cargo. Swedish authorities have supplied IMO with the report as part of the Swedish work contribution to this field. This report that was published in 1982 as the first within this area is still a valuable source for those who wish to achieve a basic knowledge regarding stowage and securing of cargo onboard ships.